(b Leipzig, 21 Sept 1904; d Antibes, 7 Dec 1989). French painter, draughtsman, printmaker and photographer of German birth. Early in his life he developed an interest in music, astronomy, philosophy and religion, but eventually above all in painting. His first enthusiasm was for the work of Rembrandt, then in 1921–2 for that of Lovis Corinth, Max Slevogt and the Expressionists, in particular Oskar Kokoschka and Emil Nolde. In 1922, before he knew anything about abstract art, he painted a series of completely abstract watercolours of a loose, non-formal kind, followed in 1923–4 by a number of abstract drawings in charcoal and chalk, for example Scène goyesque III (see exh. cat., no. 14). In 1924 he became a student of both philosophy and art history at Leipzig University and of painting at the Kunstakademie, and was present in 1925 at a lecture by Vasily Kandinsky, his first contact with the abstract movement. Although he was advised to study at the Bauhaus, he chose instead to go to the Kunstakademie in Dresden, where the teaching followed traditional lines. At the Internationale Kunstausstellung in Dresden in 1926 he saw for more or less the first time modern paintings from outside Germany, and in particular works by Henri Rousseau, Picasso, Georges Rouault, Henri Matisse and Georges Braque. In 1931 Hartung had a one-man exhibition in Dresden, but success was not forthcoming. Sick and short of funds, he spent the next three years on Minorca. He returned to Germany but, abhorring Nazism, settled in Paris in 1935; he became a French citizen in 1946. In World War II he served with the French Foreign Legion in North Africa and Alsatia, where he was seriously wounded. His service was interrupted by confinement in a Spanish concentration camp, from which he was released as a result of U.S. intervention. Hartung's mature style, which involved swirling, energetic linear motifs, found an eager public after the war. A successful showing of his work in Paris (1947) was followed by exhibits elsewhere in Europe and in the United States, Japan, and Latin America. In 1960 he was awarded the Grand Prix of the Venice Biennale, where an entire room of the French Pavilion was devoted to his work. He had a decisive influence on the postwar generation of abstract painters in Europe. Hartung's later works became progressively calmer and more stable. Many of his works are titled by letters and numbers. Hans Hartung was one of the few artists who spent their entire life working in an Informel manner. He began studying philosophy and art history in 1924 at the university of Leipzig, but soon changed to the Akademie der Bildenden Künste in Leipzig and then Dresden. He continued his training in 1928 with the painter Max Doerner in Munich. This period is reflected in his oeuvre in spontaneous, sketchy line compositions in which Hartung was guided by the inspiration of chance and analysed the tension between the areas of colour and the lines. After a lengthy stay on the Balearic island Menorca Hartung settled in Paris in 1932. Here he met Kandinsky, Mondrian, Miró and Calder and exhibited works at the "Salon des Surindépendants". At the beginning of the war Hartung joined the Foreign Legion and returned to Paris in 1945 with severe injuries. He became a French citizen. His work during this period is characterised by suspended areas of colour superimposed by calligraphic bunches of lines. Hans Hartung had important exhibitions in Paris, Brussels, Munich and Basle after 1949 and frequently showed works at the "documenta" in Kassel between 1955 and 1964. He was honoured with the "Prix Guggenheim" in 1956 and awarded an honorary membership of the Akademie der Künste in Berlin. 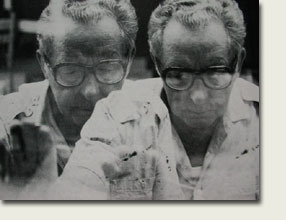 He was awarded the Great International Prize for Painting at the Biennale in Venice in 1960. During the 1960s Hartung made monochrome areas of colour in which he engraved rows of parallel grooves, thus introducing not only a calligraphic but also a three-dimensional element into his work. Hans Hartung published his memoirs called "Autoportrait" in 1976. One year later he became a member of the Académie des Beaux-Arts in Paris and in 1981 was awarded the Oskar-Kokoschka-Prize of the Republic of Austria. The large number of awards Hartung received for his work prove him to be an artist of international importance.